Yes, you can recover from a flood. Choosing the right contractor is crucial for complete Flood Damage Restoration. Choose AF Environmental. Did you know mold can develop within 48 hours of a new moisture source? Choose AF Environmental for toxic mold remediation and removal. Mold spores only need 48 hours to develop once a new moisture source is introduced. It does not take very long after for mold to germinate and spread throughout the property. They can spread through a variety of ways including the HVAC system or travel to different areas on clothing, pets or visitors. There are hundreds of various mold species and many of them are harmless. However, there are strains of toxic mold which create the most problems within a property. People exposed to toxic mold can experience nausea, dizziness, fogginess, respiratory issues, or even death. Mold is not something that should be ignored. Instead, it needs to be remediated by a qualified mold remediation professional. AF Environmental is the industry leader in mold remediation. Certified by the IICRC, we have worked on countless mold remediation and mold removal projects. Since every project provides different challenges, we help decrease the variables by following a specific and proven mold remediation process. AF Environmental services the Dallas/ Ft. Worth metro area. Established in 2004, our service area includes but is not limited to the counties of Tarrant, Parker, Dallas, Denton, Collin, and Johnson. If you suspect mold is getting out of control in your property, give us a call for a free consultation. 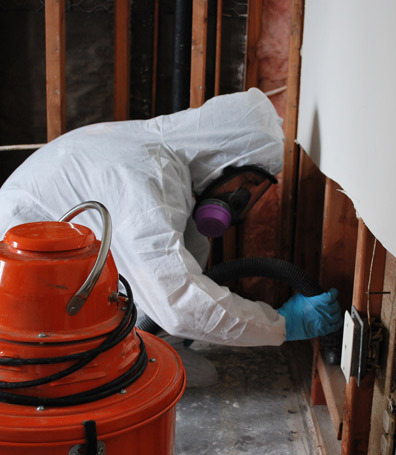 AF Environmental breaks down the mold removal and mold remediation process into three stages. EPA laws and regulations provide guidelines to ensure proper safety is addressed during the remediation process, and that all areas are protected from the spread of mold spores. What is the difference between mold removal and mold remediation? It all boils down to what we can salvage and what needs to be removed. At AF Environmental we do our very best to salvage as much of the damaged building materials as possible, while keeping safety top of mind. Containment - For mold remediation projects, we build a double cell containment structure for optimal protection. We build a decontamination room and a remediation room. This helps keep mold spores in the dedicated remediation space. Negative Pressure - Once containment is established, we will seal off all HVAC vents, windows and doors. We will then place negative air machines in the space to keep contaminants secured. These machines are equipped with HEPA filters that remove 99.95% of dust and particulates. Removal – During this step, our technicians will determine what can be kept and what needs to be removed. Building materials that are removed will be properly and safely disposed. Sterilization - Once the damaged materials are removed, all surfaces are cleaned and decontaminated via wet/dry HEPA vacuums and high-powered cleaning solutions. This is what we refer to as the remediation process. Upon the completion of the mold remediation and mold removal process, the contained area will remain in place until testing can be done. The test consists of a combination of air sampling and visual testing, taking air and physical samples in the space to determine remediation has been complete. The samples are then sent to a laboratory off-site who will generate a clearance report. As soon as we get a positive result back from the laboratory, our crews will arrive within 24 hours to break down the containment walls and return your property to its pre-remediation condition. If you have discovered large amounts of mold in your commercial business or home,it is time to call a mold remediation professional. The longer you wait, the greater the risk of dangerous toxic mold. Growth can also reach a tipping point of no return- where remediation becomes more necessary than ever. When you choose AF Environmental, you can be confident we will do a thorough job in removing mold and remediating the surrounding areas. Every project is different, each taking a different amount of time. For commercial buildings, the mold remediation process could take longer due to its complexity or additional surface area to remediate.